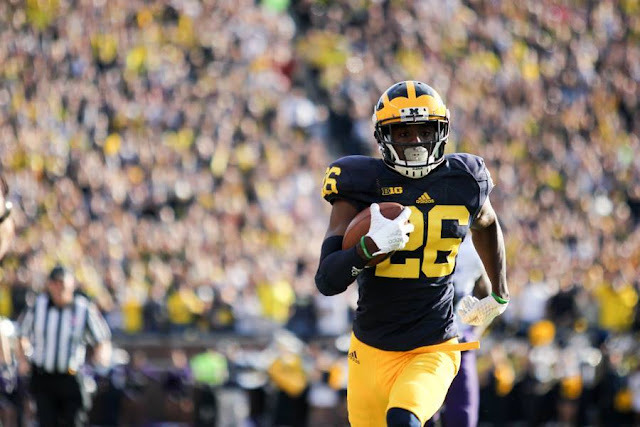 It was business as usual Saturday as the Michigan Wolverines got off to a quick start against Northwestern, and keeping things going as they earned their fifth victory of the season, matching last seasons win total, and a great deal of momentum heading into next weeks clash with Michigan State. Northwestern won the coin toss and deferred to the second half, a decision they would soon regret as Jehu Chesson took the opening kickoff back 96-yards for the first kick return touchdown since Darryl Stonum did it back in 2009 against Notre Dame. "That was a huge play, before you know it we're up 7-0," Jake Rudock said after the game. "It's a great confidence booster." The high tempo effort did not end there, however. The defense forced a quick three and out against the Northwestern offense and marched the ball right back down the field to take a 14-0 lead early in the first quarter. Jourdan Lewis continued his dominant campaign this season showing why he is considered one of the best corners in the country right now. Right after Jabrill Peppers dropped what was a sure pick six, Lewis was able to pull the ball away from a Northwestern receiver down the sideline, and run it back for a touchdown. "Jourdan is the best corner in the country," Peppers said after the game. "That makes everybody's job a lot easier when you got a guy out there who's gonna' shut down half the field." For yet another week the defense played a stellar game, but it was yet again the offense that played a steady game and looked very good. Jake Rudock looked in sync with his receivers, and the offensive line did an excellent job blocking the tough Northwestern defense to open up holes for the running game. "I'm real pleased with our team, all three phases had great success," head coach Jim Harbaugh said after the game. "Defense had a tremendous shutout, offense played really good football." The Wolverines spread the ball around in the running game as nine different players ran the ball for a total of 201 yards. The leading rusher was DeVeon Smith who ran the ball eight times for 59 yards. Derrick Green had 12 carries for 47 yards and added a touchdown. Rudock and Drake Johnson also had rushing touchdowns each. Rudock completed 17 of 23 passes for 179 yards on the day. He did not throw a touchdown pass. Defensively the Wolverines only allowed 168 yards to the Wildcats on their way to yet another shutout. Next week the Wolverines will clash with Michigan State, in what will be a pivotal game for in the Big Ten standings, and national rankings.